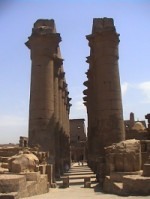 Like in other ancient civilizations, religion played very important role in ancient Egypt as well. Religion and religious beliefs in ancient Egypt were greatly influenced by agriculture which was depended from annual Nile floods and from the sun. Nile played an important role in the myth of creation, while the sun became considered the source of life on earth and worshiped in the form of Atum-Ra, the sun creation-god. According to the Egyptian myth of creation the universe at the beginning was filled with the primeval waters of chaos, the god Nun (or Nu) out of which the god of sun created earth. The ancient Egyptians were highly religious people. Initially every city had its own god but eventually particular gods came to be worshiped throughout Egypt. Ancient Egyptian religion was also greatly influenced by the ruling dynasties and changes of capital cities. Atum was initially the god of creation but after the transfer of capital to Memphis Atum was replaced by Ptah. With establishment of Heliopolis as capital city the sun creation-god became Atum-Ra who was replaced by Amon-Ra when Thebes became capital of Egypt. 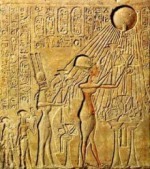 Pharaoh Akhenaten (Amenhotep IV) tried to establish monotheism by worship of a single sun-god Aton typically depicted as sun disk but his successor Tutankhamun renewed the old cult of Amon-Ra. The cult of Osiris was one of the most popular cults in ancient Egypt. Osiris was worshiped as god of fertility and afterlife. According to the Legend of Osiris and Isis, Osiris was the son of sky goddess Nut and the earth god Geb, and was killed by his jealous brother Set who wanted his throne. His sister and wife, Isis searched and found his body. She magically brought him back to life and they conceived a son - Horus. Osiris afterwards died for the second time, while Set found his body, cut it into pieces and shattered them throughout Egypt. Isis gathered all parts of Osiris’ body and bandaged them together. Osiris resurrected and became the god of the underworld, while their son Horus defeated Set and became the ruler of Egypt. 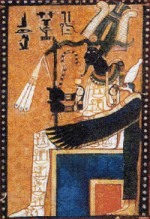 The Legend of Osiris and Isis greatly influenced religious beliefs and religious life in ancient Egypt. Ancient Egyptians believed that pharaohs were the reincarnated god Horus, while ancient Egyptian burial custom - mummification was also inspired by the Legend of Osiris and Isis. The legend says that Isis gathered all parts of Osiris’ body and bandaged them for proper burial (which is by some scholars considered first record of mummification) and Osiris resurrected as the god of the underworld. There was also a variety of other gods and goddesses who controlled certain aspect of the nature and were mostly benevolent but demanded worship, religious ceremonies and rituals, gifs and sometimes animal sacrifices. Great temples and temple complexes were built to worship and honor the gods and goddess. Among the most notable and impressive temples are the Karnak temple complex dedicated to Amon- Ra, Abu Simbel temple complex dedicated to Amon-Ra (the large one) and the Luxor Temple dedicated to Amun, Mut and Khonsu. Ancient Egyptian religion also reveals traces of zoomorphism - animal worship which was probably the oldest form of religious worship in Egypt. Each of 42 nomes had its own animal totem such as cow, cat, bull, crocodile, jackal, ibis, etc. which eventually became embodied in deities many of which were presented in a human body with an animal head.